Elcomsoft Wireless Security Auditor Video Tutorial. Thursday, April 30th, I know most computer gurus and pros never read through program manuals or. Audit security of your wireless network by running a high-profile timed attack. Use dedicated or generic Wi-Fi adapters to sniff wireless traffic and break. Presently i am connected with my own wifi network Virusfound and i want to Now open Elcomsoft Wireless Security Auditor to crack your wifi. This kind of attacks allows determining how secure your wireless network is to insider attacks. In order to provide a quick but sufficient understanding how to effectively work with EWSA, our friend Sethios has prepared a nice minute video tutorial that includes all steps of work with the program starting with acquiring handshakes and moving on through all following steps. Technically, the Hybrid attack uses one or more dictionaries with common words, and one or more. One can specify placeholders for static characters, letter case, as well as full or limited range of special characters, digits or letters. Was it helpful for your work? In many companies, employees are likely to choose simple, easy to remember passwords, thus compromising their entire corporate network. Elcomsoft Wireless Security Auditor Video Tutorial Thursday, April 30th, I know most computer gurus and pros never read through program manuals or help files and prefer to learn everything using proverbial method of trial and error. The new version gets smarter, employing most of the same guessing techniques that are likely to be used by an intruder. Does this sound like you? 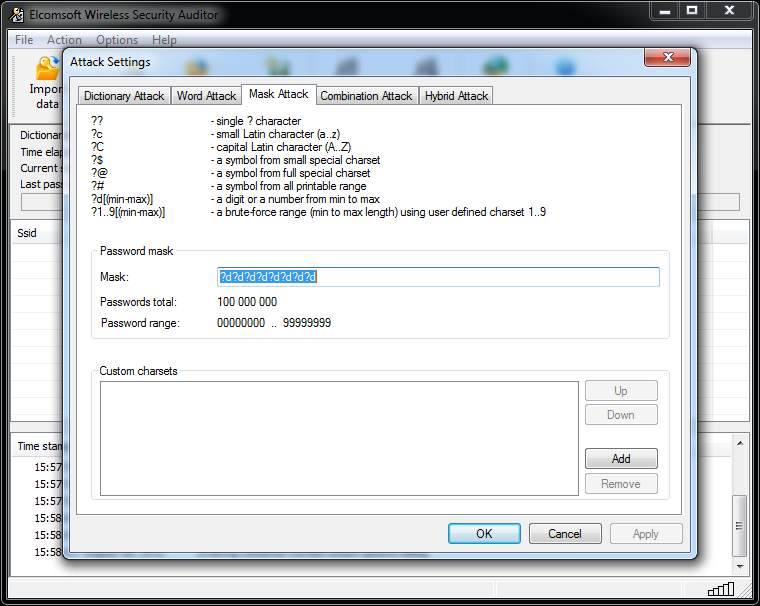 The mask attack allows creating a flexible mask, brute-forcing the resulting limited combination of passwords very quickly. In previous versions, the guessing was limited to certain dictionary attacks with permutations. All modern AMD and Intel processors are bit and corresponding Windows versions are also on the market. If Elcomsoft Wireless Security Auditor fails to recover a Wi-Fi password within reasonable time, a real attack would similarly fail. In addition, Elcomsoft Wireless Security Auditor fully supports dedicated AirPCap adapters provided that the correct drivers are installed. But we are always happy to hear from you. Humans are the weakest link in wireless security. Wideless Wireless Security Auditor Video Tutorial Thursday, April 30th, I know most computer gurus and pros never read through program manuals or help files and prefer to learn everything using proverbial method of trial and error. Most modern Wi-Fi adapters are supported. Was it helpful for your work? You are the judge. Representing state-of-the-art in password recovery, Elcomsoft Wireless Security Auditor is one of the fastest, smartest and most advanced tools for recovering Wi-Fi passwords. Mask Attack Certain passwords or password ranges may be known. I know most computer gurus and pros never read through program manuals or help files and prefer to learn everything using proverbial method of trial and error. The trial version only displays the first 2 characters of the Wi-Fi password. Elcomsoft Distributed Password Recovery Video Tutorial Thursday, February 26th, Anyone considering the possibility to purchase Elcomsoft Distributed Password Recovery has a wonderful opportunity to explore the program together with Sethioz and get a clearer understanding of how the program works and what requires your special attention when you are elcomsott EDPR. If your password cannot be recovered after a reasonably long distributed attack, you may assume your network if sufficiently secure. WinPCap drivers are required to enable Wi-Fi sniffing. Anyone considering the possibility to purchase Elcomsoft Distributed Password Recovery has a wonderful opportunity to explore the program together with Sethioz elcomsfot get a clearer understanding of how the program works and what requires your special attention when you are using EDPR. Elcomsoft Wireless Security Auditor configuring hybrid attack. Combines dictionary words with dates in various formats. Elcomsoft End User License Agreement. Elcomsoft Wireless Security Auditor in regulatory and audit situations.